Surgical Technician Don Kinney demonstrates the Ngenuity 3D Visualization System during surgery. Feb. 6, 2019 | The Harvey & Bernice Jones Eye Institute at UAMS is now using the Ngenuity 3D Visualization System for surgeries on the eye’s retina as part of its ongoing effort to harness the latest technology in the name of improving patient care. Designed for digitally assisted vitreoretinal surgery, the system makes performing these surgeries easier for the surgeon in a couple of key ways. “This is the latest technology in retina surgery. Firstly, the image of the eye is simply better. 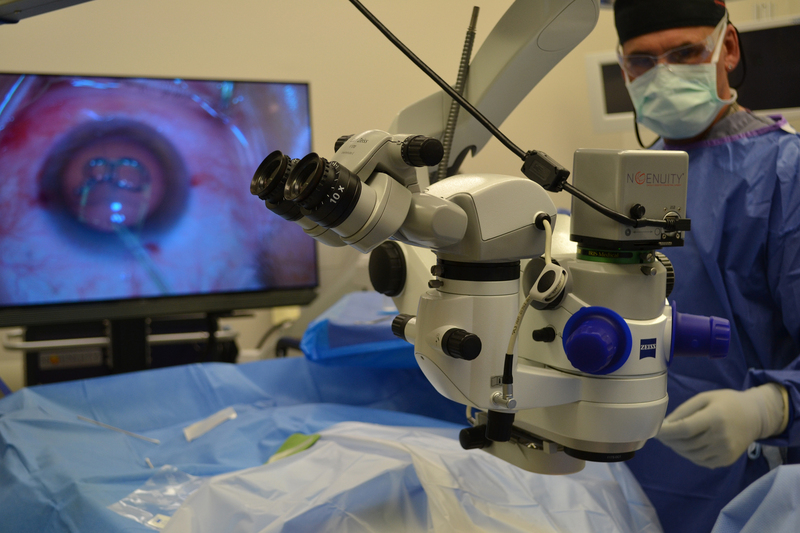 The system’s camera provides high-quality images in terms of resolution, depth, contrast and clarity, enabling the surgeon to have excellent visualization of the surgical area in 3D,” said Ahmed A. Sallam, M.D., Ph.D., an ophthalmologist and associate professor in the UAMS Department of Ophthalmology. In addition, the system’s 3D nature gives the surgeon a sense of depth perception not available in previous microscope-based systems or systems based on standard television monitors. The system offers surgeons the option for controls such as increasing magnification while maintaining a wide field of view, using digital filters, and highlighting ocular structures or tissue layers. The system is also engineered to function at lower light levels, reducing light exposure to the patient’s eye, which means improved safety. The screen display helps UAMS fulfill its mission as a teaching institute, allowing experienced surgeons to show others in real time exactly what they are seeing and the decisions they are making. “Anything that we can do to make some of these longer, more intricate surgeries easier to perform is a win-win for surgeon and patient, and we’re certainly also pleased with its value as a teaching tool,” Sallam said. “We have state-of-the-art technology at UAMS for retina surgery that is not available anywhere else in the state, including 3D viewing systems and intraoperative OCT, which make surgery easier, less traumatic and thus safer,” Sallam said.